Adolf Hitler was the Fuehrer of Germany from 1934 until 1945 when he commited suicide. As Fuehrer, (dictator) he led Germany on an military expansionist policy to create a Europe dominated and populated by the Aryan race. In 1938 he pressured Austria to unify with Germany. Next was Czechoslovakia. In 1939, Germany invaded Poland and this brought military conflict to Europe and was the beginning of World War II. He legitimized the Nazi concept of German and Aryan racial superiority and implemented governmental policies accordingly. The Nazi concept of Aryan racial superiority required the elimination of those not Aryan, those who were sick, disabled, physically handicapped or mentally retarded, those born with genetic defects, those who were homosexual, and those deemed to be racially inferior. For this purpose he built concentration camps for the systematic institutionalized mass killing of people. Throughout his term of dictatorship, political and religious opponents were arrested and then murdered in the concentration camps. Those who became Nazi victims because of what they did or believed included Freemasons, Jehovah's Witnesses, dissenting clergy, Catholic Poles, Communists and Socialists. The Jews and gypsies were the first ones to undergo Nazi genecide because of who they were. In total, Hitler is responsible for killing about 6,000,000 Jews, 250,000 Gypsies, 200,000 Freemasons, and around 4,550,000 others: Poles, Ukrainians, Russians, and Byelorussionas,. Many of these were among the best and brightest men and women. These numbers do not count those soldiers and civilians killed by military action in World War II. How was it possible that a struggling artist, who in 1907 and 1908 failed the admission exams to get into the Vienna Academy to study art, who was a shy timid speaker with a halting awkward style, how was it possible that this kind of person could be transformed into an orator with a magical flow of words, who delivered speeches that mesmorized a culturally educated and sophisticated German public, a public who admired and were proud of their Goethe and Kant? 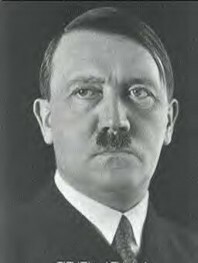 Hitler was taught by Dietrich Eckart, one of the early founders of the Nazi party and a leading member of the occult Thule Society, founded in about 1918 by Baron Rudolf Freiherr von Serbottendorff who had been schooled in occultism, Islamic mysticism, and alchemy. Eckart became Hitler's mentor, exchanging ideas with him, teaching him how to dress and speak, and how to influence and dominate other people. Eckart introduced him to a drama teacher who also helped him in public speaking. But it was Eckart who trained Hitler in techniques of self confidence, self projection, persuasive oratory, body language and discursive sophistry. Who was Dietrich Eckart? He was the master ceremonial magician of the Thule Society founded by Baron Rudolf Freiherr von Serbottendorff who had been schooled in occultism, Islamic mysticism, and alchemy. 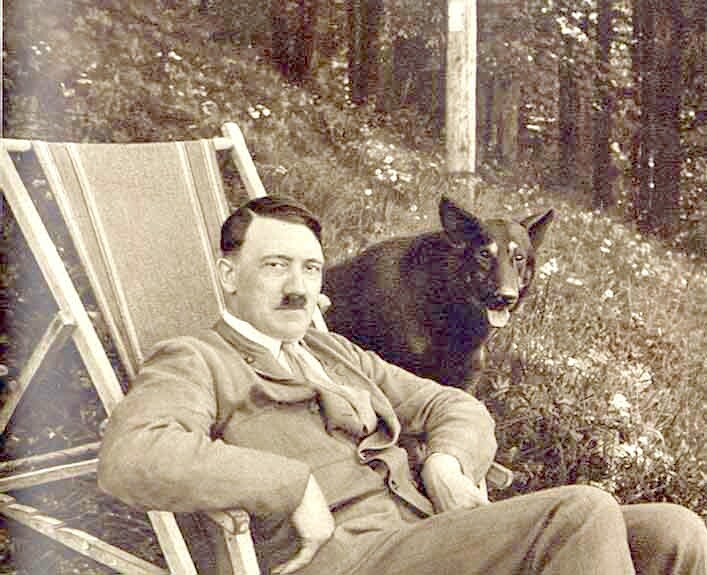 Hitler became an initiate of the Thule Society in about 1919. The Thule Society practiced Black Magic with a Satanist and Pagan orientation. In the black magic of the Thule Society, the sun played a prime role. Eckart taught altering consciousness by means of rituals that facilitated awareness of evil and Satanic entities. The rituals are filled with symbolism through which there is a conscious malicious identification with Satanic forces for the purpose of obtaining power over others to harm or otherwise deprive them. In a Black Magic ritual, consciousness changes and the ritualist becomes possessed by the Satanic forces that were evoked by the ritual. 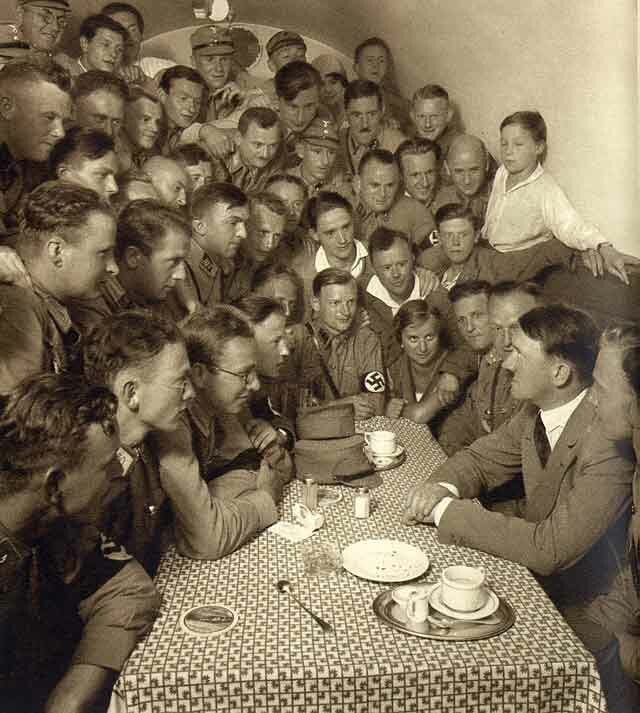 This was Hitler's state when he spoke and is the main reason he was able to mesmerize his audience. This is what Eckart taught Hitler during the years 1919 through 1923. Follow Hitler! He will dance, but it is I who have called the tune! I have initiated him into the Secret Doctrine , opened his centres of vision and given him the means to communicate with the Powers. Do not mourn for me: for I shall have influenced history more than any other German. Here is one impression of Hitler. He is different to any man I have ever seen before. A flame seems to burn within that slim figure and to look out of his eyes. There is nothing of the fanatic in his expression, but a look of superhuman energy and intensity of purpose; the face of a man specially endowed with the capacity for power. From this snippit of Hitler's history, we should examine the key word Hitler paired with Satan and with Black Magic and both. We first pair the key word Hitler with the key word Satan. The probability that a text from the ELS random placement text population would produce a smaller table than that produced by the Torah text is 23/10,000. The expected number of ELSs is set to 70. The cylinder size is 10 columns. The probability that a text from the ELS random placement text population would produce as small a table as this is 23/10,000. We next explore key words Hitler with the key word phrase Black Magic. With the expected number of ELSs set to 50, the probability that a text from the ELS random placement text population would produce a more compact table than that produced by the Torah text is 7.5/100. The expected number of ELSs is set to 50. The cylinder size is 324 columns. The probability that a text from the ELS random placement text population would produce a more compact table than this is 7.5/100. If we add the key word Satan to the key words Hitler and Black Magic we find a table that is just like the table above, but on a cylinder of size 322 columns. 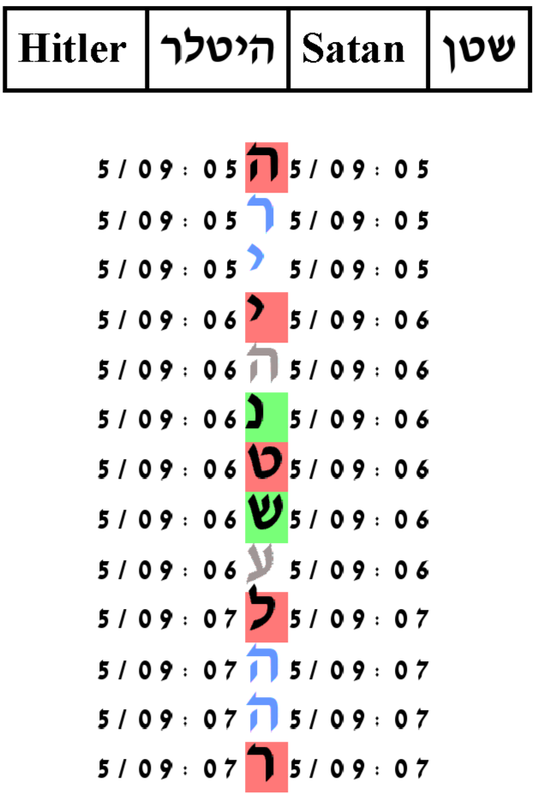 With the expected number of ELSs set to 60, the probability that a text from the ELS random placement text population would have as compact a table as the one produced by the Torah text is 15/1,000. The expected number of ELSs is set to 60. The cylinder size is 322 columns. The probability that a text from the ELS random placement text population would produce a more compact table than this is 15/1,000. Rabbi Glazerson notices in this table an ELS of the key word Sorcery or Sorcerer. It has the same letters as the Hebrew word for snake, but with different vowels for either Sorcery or Sorcerer. The cylinder size is 322 columns. There is another table also having ELSs of the key words Hitler and Black Magic. This table is, however, not statistically significant; but it has an interesting parallel geometry and as well it has ELSs of the additional key words Snake and Dog. In Judaism, Snake is a symbol of evil; it is associated with the ability to deceive and corrupt. It was the snake who persuaded Eve to go against a commandment of God and eat from the tree of knowledge of good and evil. The Zohar uses the word dog to refer to Amalek. Amalek was the first foe to attack and kill Israelites after they had been redeemed from Egypt. Rashi tells us that the Amalekites were magicians and used witchcraft magic to help them be victorious. (Exodus 17:9). See also (Yalkut Reubeni, and Chronicle of Jerahmeel, 48:13). Remember what Amalek did to you (Devarim 25:17). The Zohar explains this question. Two times the Torah indicates that Amalek is the one against whom war should be waged until his memory be blotted out forever (Exodus 17:14-16, Deuteronomy 25:19). Over history, Amalek became a reference to any people whose ideology was to exterminate Jews. The column size is 8 columns. Note the parallel geometry of all but one of the ELSs.